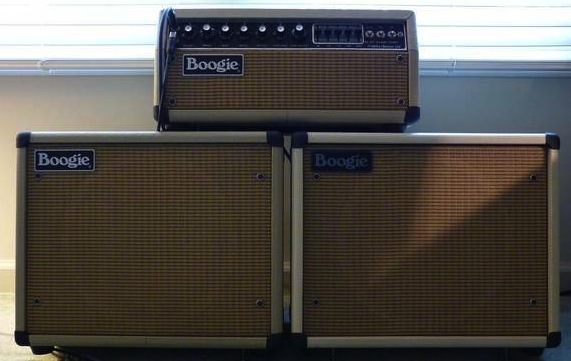 Mesa/Boogie amplifiers started out as a joke. Literally. 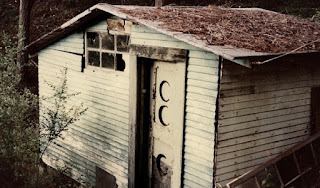 In 1969, Randall Smith was running a small repair shop north of San Francisco called Prune Music, working on gear from local bands like the Grateful Dead and Jefferson Airplane, when roadies from Country Joe and the Fish dropped off a bunch of the band's equipment for him to take care of. They also wanted to play a practical joke on guitarist Barry Melton, and asked Randall to do something "wild" with his little 12-watt Fender Princeton combo... something that would blow his mind immediately upon plugging in to it. Randall got the idea to squeeze a Bassman-style 60-watt 6L6 circuit into the chassis, along with a JBL D120 12" speaker, which just barely fit. Upon finishing up this clown car of an idea, he asked a frequent customer who just happened to be hanging around the shop that day to try it out... at first disregarding it as just another Princeton, Smith convinced him to plug in... the guitarist obliged, began playing, louder and louder, drawing a crowd of anyone within earshot, and when finished, exclaimed, "Man, that little thing really BOOGIES!". 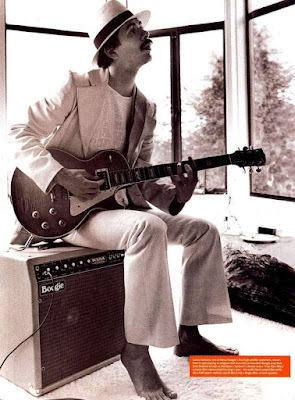 That guitarist was Carlos Santana, and he ordered a similar hot-rodded Princeton for himself immediately, which was used for his classic album Abraxas. While Randall kept busy "Boogie-izing" Princetons for local clientele in the Bay Area, he also began building custom amps from the ground up at his home workshop in Lagunitas (a converted dog kennel in his backyard, actually). This shop became MESA Engineering Ltd., the name inspired by his side job as a Mercedes-Benz mechanic (not the CA or AZ towns as often assumed). Smith was inspired by the precise engineering and heavy-duty durability of Mercedes engines, and overbuilt his musical creations with a similar style. The next step in the evolution of his design came when guitarist Lee Michaels asked for a custom preamp that would capture the sustain of a cranked-up tube amp, but able to be run thru his clean solid-state Crown DC-300 power amps. Randall added an extra tube stage to the preamp circuit he'd been using, as well as multiple gain controls at certain points in the circuit, all controlled simultaneously, creating "cascading" gain, and the first high-gain tube preamp was born. He then combined these two ideas into one chassis, with the cascading gain preamp feeding into a Bassman-style GC6L6 output section and single 12" speaker; This combo would later become known as the Mark I, but at that time, in 1972, it was simply the MESA Engineering Boogie model (if it says Mark I on the faceplate, it's a reissue). The finished design featured two separate channels with independent inputs and volumes, a shared EQ section with pull knobs for Bright and Treble Shift, and a master volume control. Input 1 had the extra cascading tube stage for increased gain and sustain, while Input 2 was similar to the original Bassman preamp circuit. 60 or 100-watt output, spring reverb, and an additional 5-band post-preamp graphic EQ were options, as well as the choice of Altec 417, JBL D120, or EVM-12L speakers; the most popular configuration was the "HunRee", 100 watts with reverb (the reverb control was on rear of chassis, along with presence). Caring about cosmetics as well as tone, Smith built his own exotic hardwood cabinets with wicker cane grills, which became a trademark look throughout the 70s and early 80s. Blonde tolex covering was also very popular as a lower-priced option, as well as other custom colors and patterns. A 1975 ad featuring Santana and a blonde Mark I combo, like the model pictured to the right. 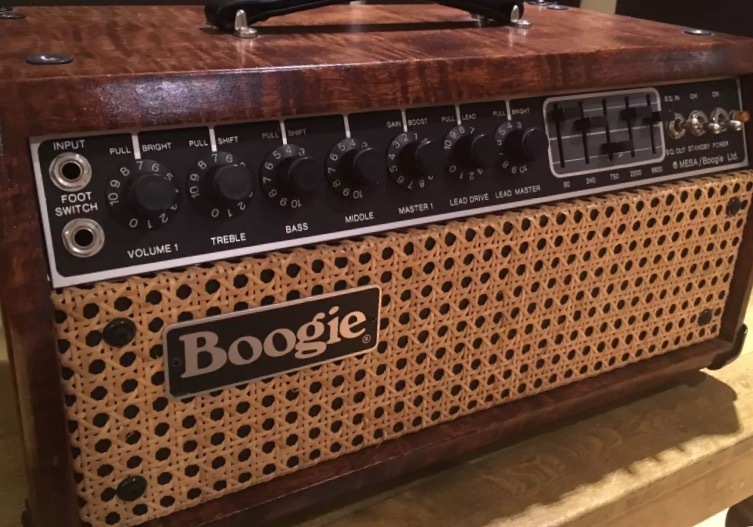 Santana would acquire one of these original Boogie 100-watt combo amps almost immediately, in a snakeskin-covered cabinet with Altec 417 speaker, which was used for his Budokan Japan performance and subsequent live album Lotus. 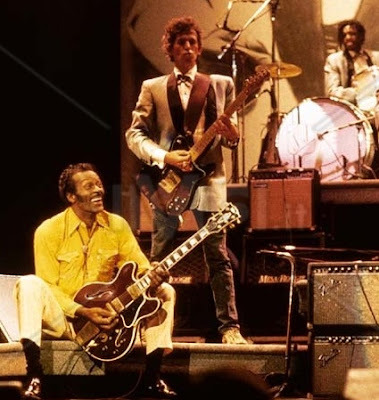 At one point in the mid 70's, while hanging out with Bob Dylan in New York City, Carlos was invited to join the Rolling Stones at Madison Square Garden... he hopped in a cab with his guitar and Boogie combo, watched their set, then jumped onstage for the encore tune, "Sympathy for the Devil"; Legend has it that when he hit the first note of his solo, both Keith Richards and Ronnie Wood immediately turned to him with a "what the hell is that amazing sound?" expression, and the next day, Keith ordered his own... six of them, in fact. 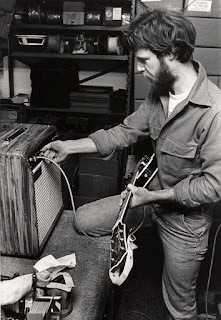 The only problem arose when Stones management told Randall Smith, "The Rolling Stones don't pay for gear; they get it for free"; Smith then spoke with Keith directly, and explained that he was building these amps by hand, mainly by himself, and simply couldn't afford to give them away for free, no matter the artist. 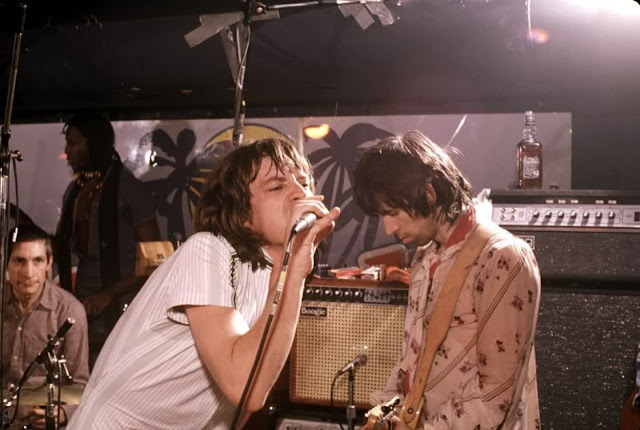 He also explained that even the Stones would have to wait in line for their amps, which was about seven months at the time. Keith obliged, and would use Boogies from 1977 until 1993 on all major tours and albums, including the Chuck Berry "Hail! Hail! Rock'n'Roll" concert and documentary film. 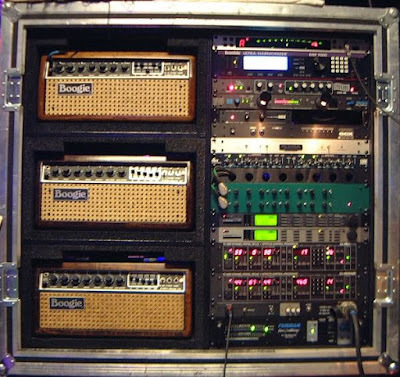 Ronnie Wood also used them, and the Stones would purchase over 40 amps and cabs from Smith over the years. 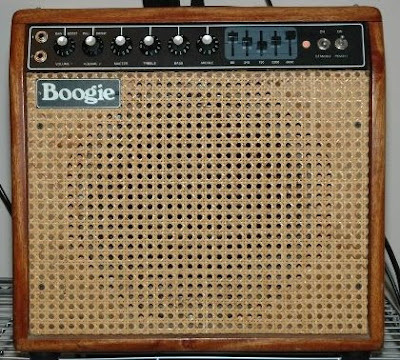 Other early Boogie users included Pete Townshend of The Who, jazz/fusion great Al DiMeola, and both Jerry Garcia and Bob Weir of the Grateful Dead. Smith, along with growing help, would build nearly 3,000 Boogie amps in the same Lagunitas shop from 1972 thru 1978, eventually moving to a larger facility (with a much larger staff) in Petaluma, where the company remains to this day. As the next model began taking form, MESA/Boogie Ltd. was created, and the Mark series name was born. In 1978, the Mark II was released, leading the original Boogie to be forever known as the "Mark I" in amplifier lore. The Mark II introduced channel switching for the first time (via footswitch or push/pull knob), separate master volume controls for each channel, and renamed the Lead channel input volume "Lead Drive", a more accurate description, as well as a new Gain Boost pull knob for the lower-gain channel (an additional Bright pull was added for the Lead channel as well). The main difference from the Mark I circuit was that the preamp gain now came after the EQ section, resulting in a tighter, more focused sound, which would become the signature sound of Mesa moving forward. The Mark Il was also available in a head or combo format, and was switchable from 60 to 100 watts output. Graphic EQ and reverb were options, just as on the Mark I, but the reverb could be noisy on these models, and the extra EQ deemed an unnecessary expense by many, although it worked wonders to tame a boomy cab or room. Around this time, the Son of Boogie (SOB for short) was developed as the first Mark I-style reissue. While the Mark II pushed the line forward, the SOB kept it simple, just as it began with two independent channels, separate inputs and volumes, shared EQ (no pulls) and master volume, in head or combo format. Reverb was an option as well. This was still a hand-built amp that shared the same chassis as other models, with no skimping on quality. 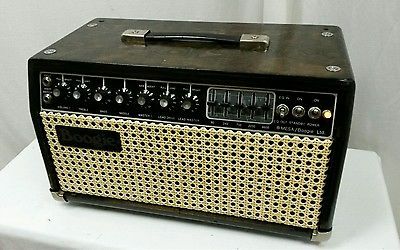 The Mark IIB revision, released in 1980 (and from here on rendering the original Mark II as "IIA"), added the first tube-buffered effects loop to a guitar amp, and introduced Mesa's patented Simul-Class output technology, wherein one pair of 6L6 output tubes run in class AB pentode mode, as the norm on previous models, but now another pair of either 6L6 or EL34 tubes could be run in class A triode mode, either simultaneously or switchable. All four tubes together would result in 75 watts RMS output, whereas just the class A pair would be 15 watts. The front panel remained identical to the IIA, and was available in the standard 60/100 watt power model as well. The IIB line also introduced the first Coliseum Series 300 models, designed with arena rock in mind. Available as widebody heads or 1x15" combos, the Coliseum models featured 6 GC6L6 output tubes for 180 watts RMS power and nearly 300 watts peak at clipping. 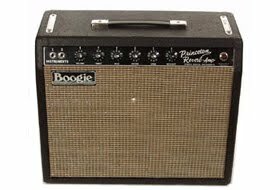 Both Keith Richards and Ronnie Wood of the Stones used two of these heads each through EV-loaded 4x12" cabs on their '82 world tour. The Coliseum Series would be the rarest of the Boogies, with only 500 or so made over the course of the IIB-IIC-IIC+-III lines. Note: If you're ever trying to identify a Mark series amp from a distance, count the number of "Pull" features above the knobs... Mark I has 2, IIA & IIB have 5, and IIC/C+ have 6. 1983 would be a pivotal year for Mesa, as it saw the updated Mark IIC & C+ amps, the zenith of over a decade of design and most coveted of the early Mesa line, still the go-to amp for some players over 30 years later. The Mark IIC improved a persistent problem with popping in the channel footswitching by using optocouplers rather than hardwired relays, and also cleaned up the noisy reverb circuit, while adding a new Bass Shift pull option that extended the low frequency content. The C+ revision took the gain a step further with a dual-cascading preamp stage on the Lead channel, and also improved the tube-buffered effects loop from previous versions, making it much more usable with pedals as well as rackmount processors. The graphic EQ now became a mandatory option for many, as it interacted incredibly well with the thicker, creamier, higher-gain lead channel, and helped refine and enhance the improved clean tone as well. The IIC+ is regarded as the pinnacle of the line, and still the studio amp of choice for James Hetfield of Metallica, John Petrucci of Dream Theater, and many others. It was replaced by the 3-channel Mark III in 1985, but is still sought after highly in the vintage market, fetching as much as three times it's original price, as some claim it's tone has never been matched or improved. It was the last of the classic Boogies, that's for certain. 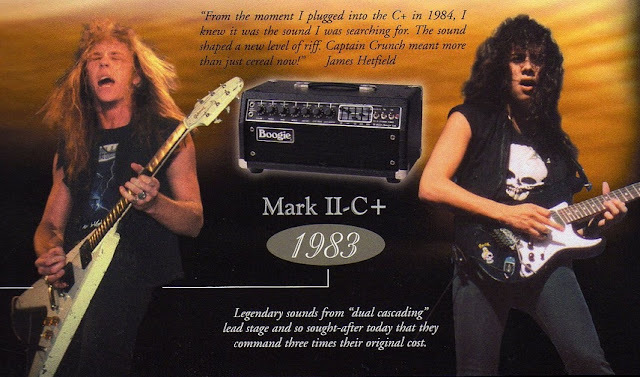 The Mark III underwent many revisions from 1985 thru 1989, and while a great-sounding amp in it's own right, never caught on as well as the earlier models, mainly due to a not-so-user-friendly 3-channel layout crammed into the traditional size chassis. It was replaced by the Mark IV in 1990, which paved the way for the future with a larger chassis and front panel, allowing independent control of most features on all three channels, and stayed in production for nearly 20 years before the current Mark V took over the line. More recently, Mesa has revived the IIC+ in the form of the JP-2C John Petrucci signature head, which features three channels (two lead, one rhythm), all inspired by the IIC+, and two graphic EQs that can be switched into any of the channels. These newer amps, along with the hugely successful Rectifier line, are marvels of engineering and analog circuitry at it's absolute finest, and continue Randall Smith's early vision for innovation, following the "spirit of art in technology" mission statement. 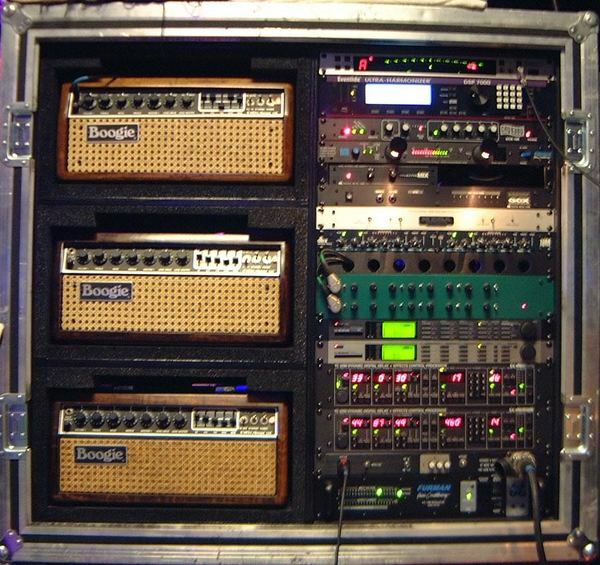 Too many knobs for me though, I'll take an original Mark I Boogie any day. Be careful, he might sue you. Everything is patented and copy written and he has many lawyers.